What is the Best Way to Predict Disease Progression in Patients With Inactive HBV? In patients with chronic hepatitis B virus (HBV) infection who are negative for HBe antigen (HBeAg), monitoring levels of HB surface antigen (HBsAg) can predict disease progression, researchers report in the October issue of Clinical Gastroenterology and Hepatology. Most persons chronically infected with HBV clear HBeAg and enter an inactive carrier phase, characterized by low or undetectable serum levels of HBV DNA levels and normal levels of alanine aminotransferase (ALT). However, the virus can still replicate in these patients and some develop chronic HBeAg-negative hepatitis, associated with further deterioration to liver, risk of decompensation, and development of hepatocellular carcinoma (HCC). It is therefore important to accurately identify inactive carriers who are still at risk for hepatitis. In HBeAg-negative patients, levels of HBsAg have been associated with disease progression and development of HCC. A single-point measurement of HBsAg combined with level of HBV DNA can identify patients who will remain as inactive carriers 1 year later. HBeAg-negative HBV infection is associated with a pattern of virus fluctuations followed by long-term remissions, so risk for progression should be continuously monitored. No studies have been performed on long-term risk of progression to active disease in relation to annual measurements of HBsAg level. Willem P. Brouwer et al therefore performed a retrospective study to improve existing prediction rules, using repeated measurements of HBsAg levels to determine the inactive carrier phase through long-term follow-up. They collected data from 292 HBeAg-negative patients with chronic HBV infection and no cirrhosis who visited outpatient clinics at tertiary care centers in Europe, Asia, and Australia. Patients were determined to be carriers of inactive HBV (level of HBV DNA <2000 IU/mL and serum levels of ALT that remained normal) or to have HBV activity (level of HBV DNA fluctuating >2000 IU/mL and/or abnormal levels of ALT) each year, for a median time period of 8 years. Brouwer et al found that within 1 year of their initial visit to the clinic, 189 patients (65%) had inactive HBV and 103 patients (35%) had active HBV. Cumulative probability to remain an inactive carrier during follow-up based on HBsAg level at study inclusion. *HBsAg 100–1000 IU/mL vs>1000 IU/mL: HR, 0.61; 95% CI, 0.3–1.2; P = .144. Using dynamic analysis, the authors determined the probability that a patient would have inactive HBV at any following year differed according to level of HBsAg. 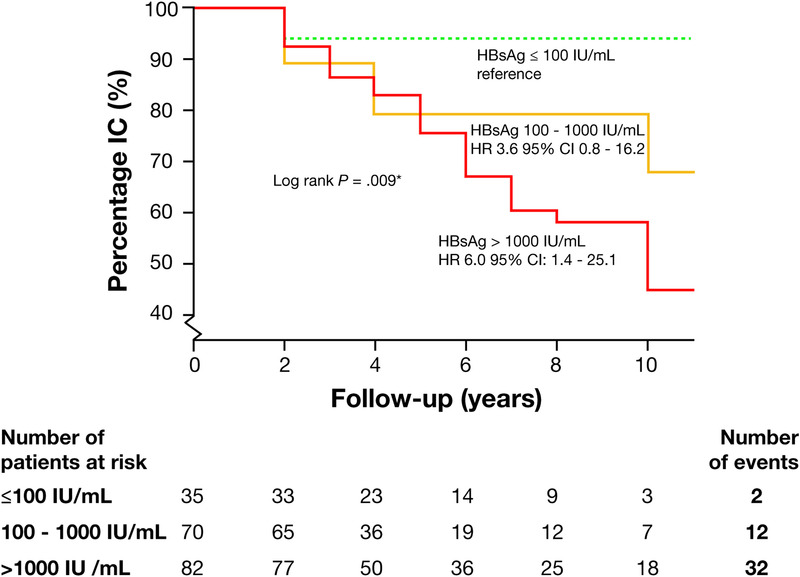 Odds were 97% for patients with initial level of HBsAg <100 IU/mL, 85% for patients with initial levels 100–1000 IU/mL, and 76% for patients with initial levels >1000 IU/mL. Having inactive virus for any 2 consecutive years predicted having inactive virus in any third year. However, 15% of patients with level of HBsAg >100 IU/mL had HBV activity in the third year. The combination of HBsAg level <100 IU/mL and HBV DNA level <2000 IU/mL identified patients whose virus remained inactive for the entire follow-up period, with 98% specificity and a positive predictive value of 97%, for all HBV genotypes. 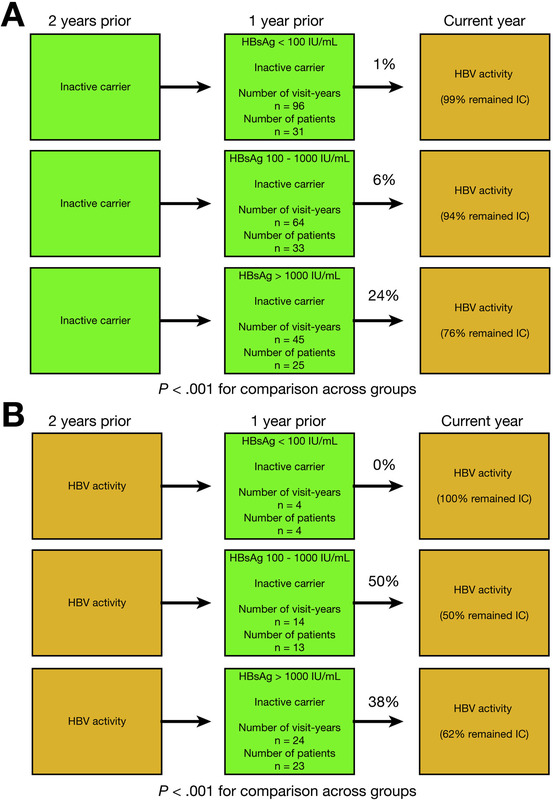 Patients with HBV activity who had levels of HBV DNA <5000 IU/mL and decreases in HBsAg of 0.5 log IU/mL or more for 1 year had a high probability of becoming inactive carriers in the next year. The authors propose to define inactive carriers, among all HBV genotypes, as those with a level of HBV DNA ≤2000 IU/mL and HBsAg <100 IU/mL. They say that patients with HBV DNA ≤2000 and a persistently normal levels of ALT during a follow-up year, but HBsAg levels 100–1000 IU/mL, should be defined as HBV remission patients and kept under close surveillance for at least 1 more year. Brouwer et al state that HBsAg levels seem to better reflect disease progression. They propose revising definitions to include HBsAg levels, to ease management of HBeAg-negative chronic hepatitis B. A New Pathway for Transmitting HBV DNA? Time for Peer Review Week!